Stateless Immigrant: I'm officially badass now! Could not wait another day, even though Mondays are the busiest days at the DMV, went and got myself the motorcycle endorsement at lunch today. 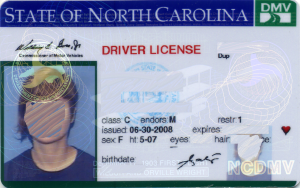 To the left is Exhibit A, my new NC driver license edited for personal information, with the endorsement. The dealership includes two full-day motorcycle rentals in the price of the course (provided you get the endorsement), so soon-ish, whenever time permits and my hands and arms don't hurt anymore I'll go get a bike for a day and practice in some empty parking lot and some quiet side streets. @luke: Is that a challenge?